I have been thinking of a subject for my first entry so here goes. I would say that the most important thing to do is get out and fish. I hear people complaining all the time of the difficulties they face getting fishing time. Why? I think a lot of it has to do with the fact that most folks think fly fishing=Trout. That's not the case at all. Fly fishing is my favorite way to spend my free time (bird hunting is a close second), if all I ever fished for was trout I'd get maybe a week or so a year in. Instead I concentrate my efforts on fisheries that are reasonably close to home. One reservoir I fish is six miles from my house has Bass,Crappie and Bluegill in it. I can be fishing within ten minutes of pulling out of my driveway. Okay that's pretty tame as far as fishing outside the box goes. Well, how about Carp in the local park ponds? There is one where I landed a fifteen pounder not long ago only eighteen miles from me. I know some of you may go Carp blah! Can you think of another freshwater fish that can peel off 40-50 yards of backing?What about hitting the beaches for Surf Perch, Halibut, Yellowfin Croaker, Leopard Sharks that are five feet plus and more! A big Leo will have you wondering if you have enough backing on your 8wt to finish what you started. The fact that I fish all these areas that are within a half hour or so of my house equates to more fishing time for me. That in turn means more time working on my casting abilities and reading various kinds of water. In the long run these things make a better much more rounded fly fisherman. if that doesn't do it for you how about more time fishing= more fish caught. That ought to grab your attention. After all isn't catching fish the reason we fish? Regardless of the beauty that can be found even in places like the L.A River. I'll lay off for now but the next time you flub a cast or miss a fish think to yourself, is this due to a lack of practice? If so then the next time you find yourself "wishing you were fishing". Do something about it! Get out there and explore what's in your area. I think you'll be very surprised. You may even find yourself thinking less about Trout and more about that eight pound Bass or a double digit Bonito you want to catch. When all you have is an hour or two you CAN fish. In a lot of cases you can be landing fish and home again in less time than it takes to drive to your favorite Salmonoid spot. 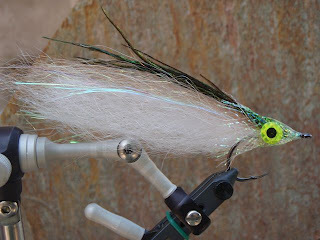 I'm gearing up for a July trip to Loreto, Baja and it occurred to me that I should share tying instructions for a basic baitfish imitation that will work for any species just by changing size and color to suit your specific target fish. 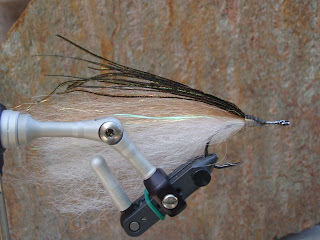 Begin by tying down a length of Slinky Fiber in the middle and folding the clump back over the hook shank and tie down. Hit it with some Zap a Gap. Tie in your Krystal Flash on top. Zap a Gap. Tie in the SF Blend in the same fashion and hit it with some Zap a Gap. Now tie in the Peacock herl being careful to keep it on the top. Zap a Gap. At this point I will usually stop and begin another fly. I tie up a bunch to this point and do the heads all at the same time. 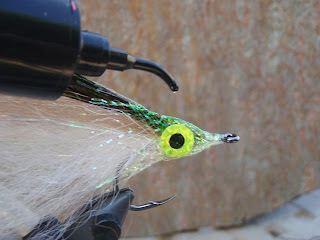 Cut a 2" piece of FlexiBody and slide over the hook. 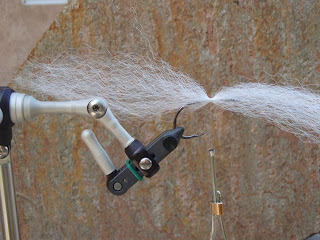 Start your thread again just behind the hook eye and secure the Flexibody in place. Color the Flexibody with a Sharpie to match the peacock. Add the self stick Prismatic eyes and then using either epoxy, UV Knot Sense or Tuffleye coat the head for durability. That's it! 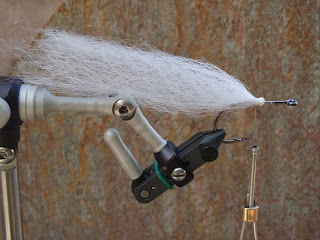 This simple pattern will work on a lot of different species and is fast and easy to tie. You can trim the wing to shape if you want. The fish don't care. 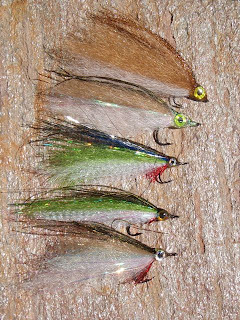 Below are some of the color and style variations that I will be using in Baja In July. 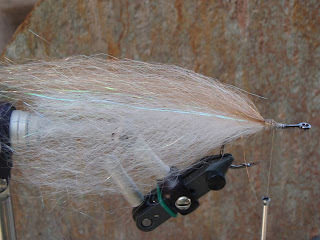 Call me if you have any questions on these tying instructions or Baja trips (818) 785-7306. - Migration barriers great and small. Waterfalls, high-velocity rapids or man-made barriers will often provide an accumulation of fish below them. Even if this is a "doable" barrier, the fish still will hold below it. They may also hold above to rest. - Turbid waters rule. Use the above rule and fish in a spot that may be fishless at any other time and with cloudy or high water, there may be fish in there. - The decreased velocity factor. In some cases, the fish will not move until the water decreases in intensity. This means that finding quality fish at times when you think their migrating should be over does happen. In other words, don't be afraid to be surprised; keep a sharp eye out for an errant hog well into the season. - Above a lake. The inlet and/or first pool theory really can be a winner. Anadromy is anadromy and be it the Pacific Ocean or a local reservoir, the rules apply. - Remain stealthy. High and turbid waters don't mean that being stealthy can't earn you an extra fish or two. It still pays to keep that tactic warm. - Mood Swings. I recently was alerted to a hog-heavy run which in less than a week had frisky feeding fish turn dark and start digging redds. Timing and luck do play a role here. Please leave spawners alone and mark your calendar for returning a week or two earlier next year. - Trapped or new-resident fish. Fish will get trapped. It's a fact of life. As water levels decrease after snowmelt or storms, look in isolated pools or side-channels. Heck, save a trout. Catch it and release it into the stream. - Use the closures. Freshly opened roads, trailheads etc. allow you to be on a spot before the hordes. The fish have had a break from humans and may be ready to bite. - Last but not least: Pre-Runoff. Sometimes a small pre-runoff window with a light spike in water temps will have fish feeding before your arroyo becomes the Colorado. Ok, I'll shut up for now. It's time to get out there. This morning my friend Artin came by the shop on his way home from the beach. He was excited by his latest surf fishing outing and wanted to share a picture of his first California Halibut that he landed on a fly and with a story of his first Corbina almost. The Corbina escaped as Artin tried to beach it in the rolling surf but he was still pretty pumped up about the whole deal and his excitement was infectious. The trip next week to Tejon Ranch seems too far away and I may have to sneak out for a morning session at Castaic Lagoon mid week. My fly tying has taken a hit for the weekend. My grown kids are in town for a visit and my fly tying room is one of the guest rooms. It feels odd not to wander in there and tie a few flies each evening. It's my relaxation each day and helps me to wind down after fighting the 405 traffic madness. 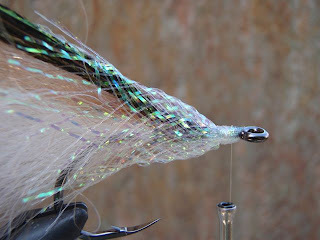 Each evening as I negotiate the traffic tangles I think of new patterns that I want to tie or new ways that I can tweak an old pattern to suit a particular fishing scenario. I allow my imagination to roam over ideas and try to come up with new patterns that will work better than what I already have. My wife, Palma, laughs at all the flies that I have. I could open a small fly shop and stock it with flies and materials but maybe the next one will be "the one". What the hell is a Blog???? I'm not sure about this whole blogging thing but, friends and clients have suggested I have one so, here goes. I am part owner of Fishermen's Spot, a fly fishing specialty store in Van Nuys, CA. The store was started by my partner Steve Ellis along with his Dad and brother back in 1970 as a general fishing tackle store. We service the entire Southern California area but, because we are near LA we get visitors from all corners of the planet (and maybe some from off the planet). I'm not sure what I will write about except that it will usually be fly fishing related. I love to tie flies so some of the posts will be related to flies that I am tying either for fun or for an upcoming trip. 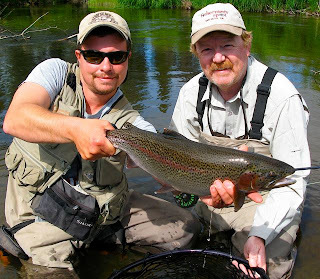 I will also have periodic trip logs from some of the fishing trips I am lucky enough to go on. Right now I'm tying for an upcoming trip to Loreto, Baja so my tying desk is littered with bucktails, super hair, and a dazzling array of flashy stuff. I'll try to get some pics of what I am working on soon and post them. Steve and I went to Hot Creek ranch with our buddy, Rob Rubin and I had the unique experience of watching a large brown trout kill and eat a 14" rainbow. I shot some very marginal quality video with my Olympus still camera and posted it on Youtube and was stunned at how many people have viewed it (1300 up to this point). I'll try and load it here too. Wow! It worked. Kinda small though. You can go to my website to see it in a larger format. So I guess this is enough to get the blog started. I have lot's more to say and I have been working on videos of my recent trip to Chile to edit them for the web. Still learning!